The major innovation is creating a successful aluminum-ion battery. Aluminum-ion batteries have been tried before, since aluminum avoids some of the flammability issues of lithium, and is cheaper. The Stanford team appears to have successfully increased energy capacity to usable levels. However, due to aluminum’s lower voltage, it holds less energy and provides less power than a comparable Li-ion cell – so more cells would be needed. The tradeoff may be worth it for certain rapid-response energy storage applications. The anode reaction is aluminum plating onto aluminum foil. 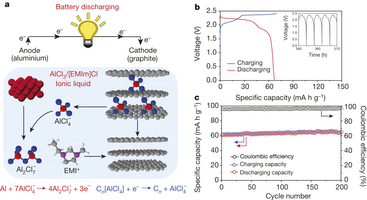 Current Li-ion batteries embed the lithium in carbon on the anode, which is safer than plating pure lithium metal like early lithium batteries did. But aluminum metal doesn’t have the same dangers. The battery uses room-temperature ionic liquids for the electrolyte (aluminum chloride anions in EmIm), avoiding some of the flammability problems of standard Li-ion battery electrolyte (LiPF6 salt in organic solvent). It would be very interesting to learn more about this electrolyte – its safety, environmental impacts, and cost – as these could be critical to the feasibility. Comments? Discharge voltage is reported at only ~2.0V compared to 3.5V for a Li-ion battery. Coulombic efficiency is 98% which may come from undesired reactions – for example, electrolysis of trace water into flammable hydrogen. It’s not clear what the side reaction is here, though the researchers appear to overcome it by supplying a large surplus of aluminum (70 mg of aluminum anode vs. 3 mg of carbon foam cathode in a Swagelok cell). In the 200-cycle demonstration, a 2% loss could easily be covered by that excess aluminum mass. This isn’t necessarily a trick or deceptive practice – it’s a perfectly valid engineering solution, and they properly account for the extra aluminum mass. Note that parts of the demonstration aren’t innovative at all: pouch cells are a standard class of battery, they can be flexible, and a puncture test is a standard abuse test. The performance under the drill test (slight temperature rise, no fire) is good though. One drawback is that the aluminum “couple” has 40% less voltage than a typical Li-ion chemistry (2.0 vs. 3.5V). This means 40% less power and energy density, so it’s not great for applications like cell phones and electric vehicles. Aluminum instead of lithium should be significantly cheaper, although 60% more mass will be needed to make up for the difference in voltage. It’s too early to judge overall cost since that will be affected by cost of the special electrolyte, whether safety systems can be simplified, etc. The battery charges at 5000 mA/g which is very impressive – this is the one-minute rate quoted in press articles. The aluminum chemistry should be significantly safer with the different electrolyte, eliminating of lithium salts, and eliminated risk of lithium plating. Dendrite shorting is still possible with the pure-metal anode but the effect of that short should be much less dangerous. The cyclic voltammetry data in the paper suggests that voltaic efficiency will be worse – the battery charges at about 2.8V and discharges at about 2.0V for a round-trip voltaic efficiency in the 70% range (from cyclic voltammetry) . Compare 90%-98% for Li-ion. Internal resistance from the ionic liquid electrolyte isn’t reported, and is likely poor as the lab cell simply uses electrolyte-soaked glass mats. However, this can easily be improved with further development. The researchers have demonstrated 7,500 cycles in the lab at the fast-charging speed, which looks very promising but we’ll have to wait until real cells and packs are built and tested. Overall this looks like a significant innovation. As always, there will be many hurdles to overcome before we see it in products. The best applications might be in specific types of energy storage (frequency regulation, demand response) where rapid response is needed, but energy density is not important. It’s not clear whether this will make it into cell phones, EVs or laptops due to the much lower energy density. How does this compare with what’s in the lab for Li-ion? What are your thoughts on the low-temperature melt electrolyte? Are we missing other concerns? Add your comment below. Looks like Elon Musk agrees with me on this one. @elonmusk Battery “breakthroughs” need to state power *and* energy density (not the same thing), plus how long they last. They usually fail on energy. Interesting about what Elon Musk has to say. He has lots of real world experience with batteries now! Excellent Tara!!! I look forward to seeing your pieces on the runway…. And what better place to start than Paris!! Rock it girl! Mine is to follow through on my inspired idea to bring my passion and travel together, hosting Pilates retreats!! !